There’s nothing quite as stressful as living in the city – think never ending queues of traffic, sky scrapers and flashing neon signs, malls and cell phone masts and the cacophony of hooting taxi’s, chattering inhabitants and blaring music. Alternatively, there’s nothing quite as soothing as a break in the mountains – and at Gooderson Monks Cowl to be more specific. Think sweeping grasslands, magnificent towering cliffs and peaks topped by starlit skies at night, beautiful trees, the haunting calls of birds of prey on the wing or the soothing sounds of waterfalls. Monks Cowl, which takes its name from the distinctive mountain between Champagne Castle and Cathedral Peak which resembles a cleric’s attire, is the gateway to some of the most magnificent and unspoilt mountain wilderness areas in South Africa and part of the 260 000 hectare Maloti-Drakensberg Park World Heritage Site. Although that should be reason enough to trade the city for the countryside, we’ve got five good reasons why some time out at Gooderson Monks Cowl is the perfect antidote to our urban existence. Oodles of research that suggests that we’re compromising our mental health by not taking time out in the peaceful company of nature. This is particularly true for children who are constantly bombarded by television, movies, computer games and mobile phones. In a beautiful mountainous environment, what you see is what you get – perfect peace. Green spaces not only soothe the soul but also allow us to breathe in that revitalizing crisp mountain air. In the countryside, you don’t need an excuse for simply laying back and doing nothing – and, when you return to your day to day routine, we can guarantee that you’ll feel rested and restored. Accommodation options are varied and exceptionally comfortable, from our 35 superior hotel rooms, either mountain or dam facing with 2 double beds, 1 executive suite with a king size bed with double shower, and 8 newly built self-catering units, fully equipped with a master bedroom on suite, second bedroom with twin beds and adjacent bathroom and 2 sleeper couches in the lounge, with DSTV, fireplace for those chilly winter nights and private patio with braai facilities – Monks Cowl provides creature comforts making it feel like you home away from home. Ever heard that expression that friends, families and important others are so caught up in the daily dash that they’re like ships passing in the night? Well, you can look forward to plenty of invaluable family time at Monks Cowl. Ditch the cell phones and play some board games or gather at our totally revamped bar, aptly called Robins Hide Away. Youngsters can enjoy the kids’ games room which comes complete with pool table, fooz ball, table tennis and movies. 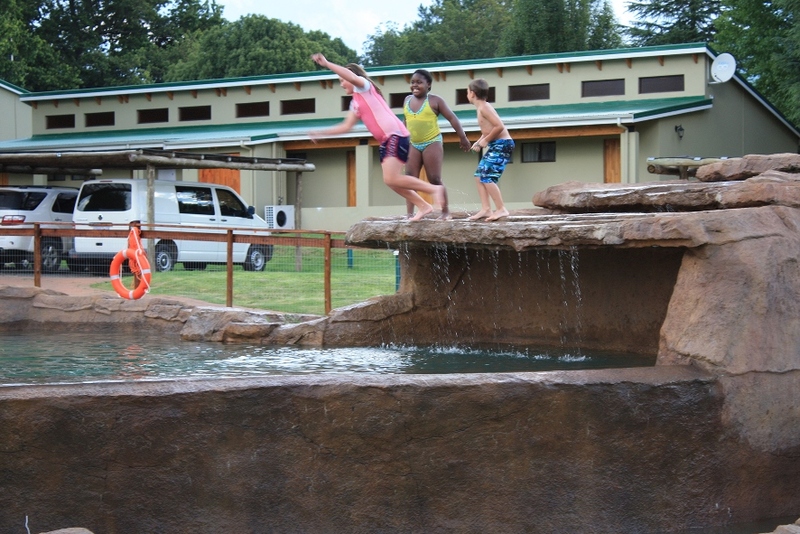 Other great gathering spots are the new lounge and the 10 seater Jacuzzi at the adventure park rock pool area. Usually, when you’re enjoying nature, you’re on the move. Being outdoors boosts energy levels and also makes exercise part of the experience rather than the chore that it usually becomes in a city. Because the area is known for its wonderful scenery, there are wonderful hikes and mountain trails through the deep valleys and forests. Hikes in the nearby Monks Cowl Nature Reserve vary from a few hours to several days and accommodate all levels of experience and fitness. It’s also fun to explore the many caves in the foothills. For example, the Battle Cave includes fascinating paintings depicting a battle between two San tribes. Closer to home, there also the Gooderson Monks Cowl Golf Resort’s 9 hole, 18-tee golf course as well as the new 8-hole adventure golf that is a must for the whole family. During summer, guests love the stunning rock swimming pool that comes complete with waterfall and slide. For active youngsters, there’s a kiddies play area with adventure jungle gym, swings and trampolines and a kiddies off road bike track. 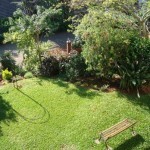 The resort also has two tennis courts, badminton, volleyball, swing ball, fishing, mountain bike trails and much more. Further afield, guests can get the adrenaline pumping with Tree-Top Canopy tours, White Water Tubing and more. There’s even an outdoor table tennis table at the adventure park rock pool and night time putt putt with glowing golf balls! Previous: Celebrate reggae this April at Wahooz! Next: Take To The Stage – Open Band Auditions!